After enjoying the Chicago Blues Fest you and your guests can cap-off a festive evening with a V.I.P. Chicago private yacht cruise on Lake Michigan and overnight stay aboard Adeline’s Sea Moose. There’s a reason blues musicians sing about “Sweet Home Chicago.” Chicago has historically been a beacon to musicians looking for bigger crowds and more places to play. Following the “Great Migration,” blues musicians from the South made Chicago one of the biggest spots in the country for blues music. 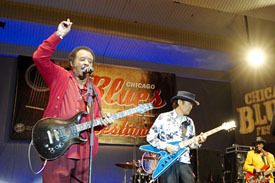 Fittingly, the annual Chicago Blues Festival is the city’s largest music festival, too. More than a half-million people flock to Chicago’s “front yard” for free outdoor concerts in the park. In continuing with four decades of tradition, the Chicago Blues Festival will celebrate the genre’s rich heritage and forthcoming talents with three days of performances — all FREE and open to the public, no tickets required.